Early 20th century design is having something of a moment. Alongside the new Bauhaus exhibition at the Barbican, another exhibition opening today also features modernist designs from the same era. In a collaboration between the contemporary rug producer Christopher Farr and The Courtauld Gallery, five hand-crafted rugs based on original designs by the Omega Workshops are unveiled at Somerset House, London. Visitors to the Great Arch Hall will encounter After Bloomsbury: Rugs from the Omega Workshops, 1913-1916, extraordinarily contemporary-looking rugs displayed alongside their original designs of nearly 100 years ago. The short-lived Omega Workshops marked one of the most creative moments in the history of modernist craft and design in Britain. Founded by the artist and influential critic Roger Fry in 1913, the Omega Workshops was a laboratory of radical design ideas involving many of the most avant-garde artists of the day, notably Fry’s young friends from the Bloomsbury Group Duncan Grant and Vanessa Bell. Inspired in part by contemporary art in Europe, especially Fauvism and Cubism and the work of such artists as Picasso, Braque and Matisse, as well as African art, the Omega Workshops created a range of objects for the home: from rugs and linens to ceramics, furniture and clothing – all boldly coloured and patterned with dynamic abstract designs. The Workshops managed to stay open during the First World War but closed in 1919. These six years saw the creation of an impressive sequence of designs of wonderful inventiveness and originality which were well ahead of their time and still look fresh and exciting today. 1. Rug design attributed to Duncan Grant or Vanessa Bell, 1913-1915. Gouache, pencil and collage on paper. Given by Pamela Diamond 1958. © The Samuel Courtauld Trust. The Courtauld Gallery London. 2. 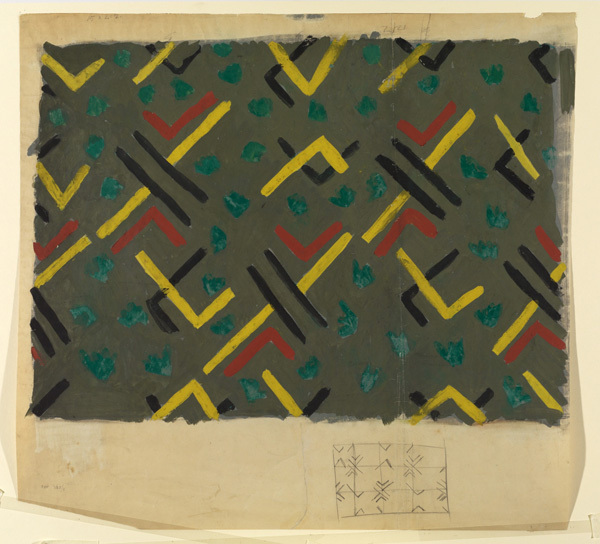 Pattern design, 1913-1914. Gouache and pencil on paper. Given by Pamela Diamond 1958. © The Samuel Courtauld Trust. The Courtauld Gallery London. 3. Rug design attributed to Duncan Grant, 1913-1915. Gouache, pencil and collage on tracing paper. © The Samuel Courtauld Trust. The Courtauld Gallery London.